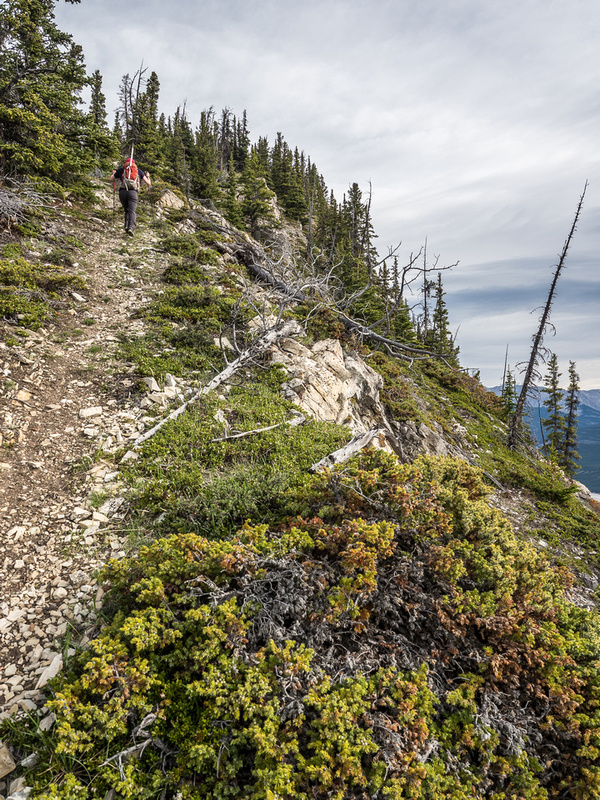 Difficulty Notes: Moderate scrambling to the highest summit with limited exposure. 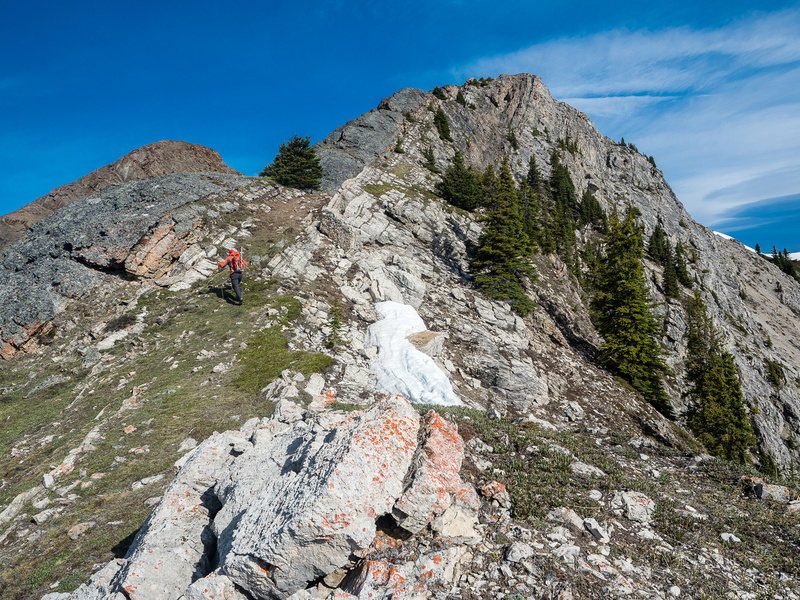 Easy scrambling to the first summit. NOTE: This was done as part of a long traverse to Two O’Clock Ridge via Landslide Peak. After a long and difficult trip that ended only a few days previous, I was a wee bit apprehensive when Mike Mitchell asked me what I was doing on Saturday, June 3. 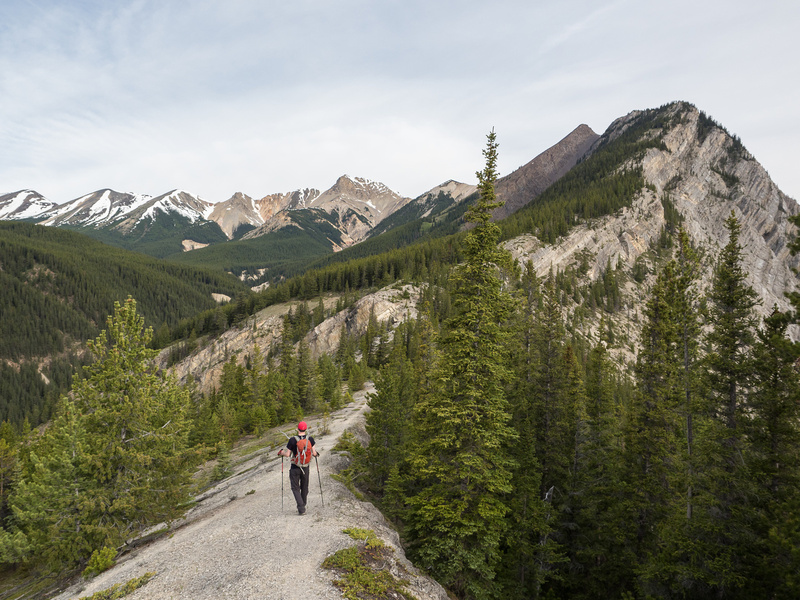 My second King Edward attempt had cost me around 50km of distance and well over 2500m of height gain, most with a heavy winter mountaineering pack and a good chunk of it either on softening snow or thick BC bush. Going down stairs still hurt, but I figured it was time to nail a summit so I said I was likely “in”. Then Mike sent me the details. 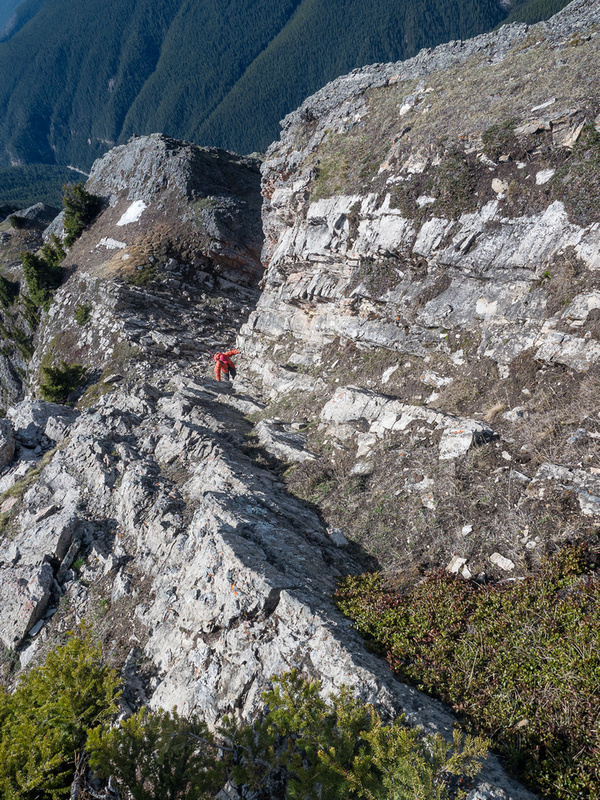 When consulting Eric Coulthard’s trip report on the loop that he names “Loop Ridge Traverse”, we noted that he only took around 11 hours, and gives stats of around 2200m height gain and 20km distance. These stats are slightly incorrect on hindsight, but we planned on a long day. We agreed to meet at the trailhead around 07:30. Mike slept in DCT while I left from YYC that morning after getting up at 03:40. The morning drive was excellent, but I was disturbingly tired already on the drive into the Rockies. 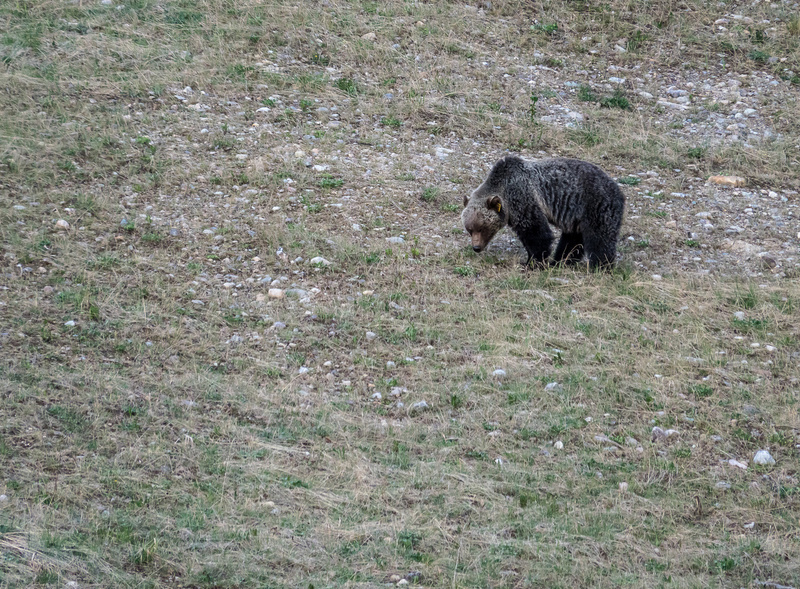 I took a 5 minute break near Lake Louise to watch a Grizzly bear feed beside the road in the early morning stillness. That was cool. I made up for lost time on hwy #93 and by 07:20 I was pulling next to Mike at the small parking area for Ernest Ross. 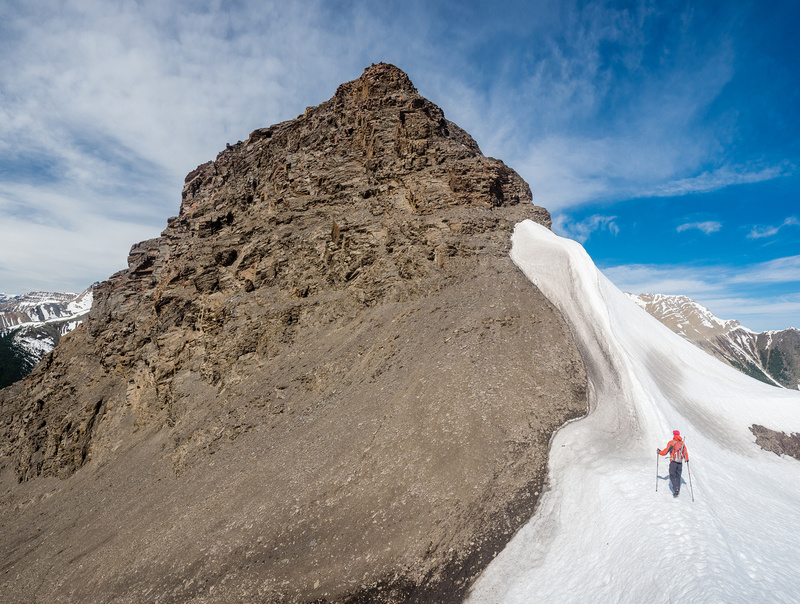 Note: This trip report is part of a loop traverse that started with Mount Ernest Ross and continued from there over four more unofficial summits including Bridge Peak, Landslide Peak, Two O’Clock Peak and Two O’Clock Ridge. Total distance for the day was around 25km and total height gain around 2600 meters. It took us a total of 15 hours to complete the traverse with some snow on route. 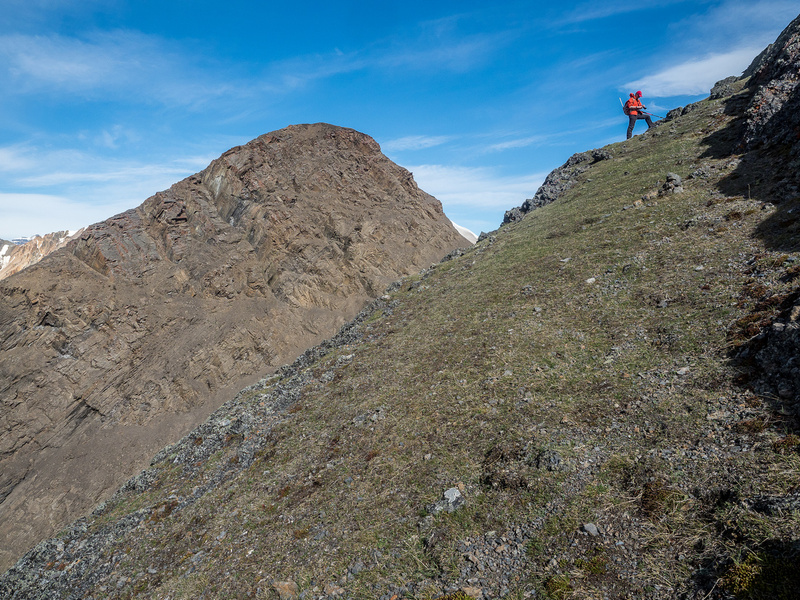 It was warm and fairly windless as we worked our way up the steep trail on Ernest Ross – no approach here, just head straight up the ridge! My pack felt fairly heavy thanks to my water bladder that I felt I should carry, considering how high we’d be for at least 12 hours or so with no running water easily available. I also brought my pocket-rocket stove and some fuel / titanium pot to make coffee part way through the day! Like I said earlier, I was rather tired already before the day really started, thanks to a hard trip a few days previous. 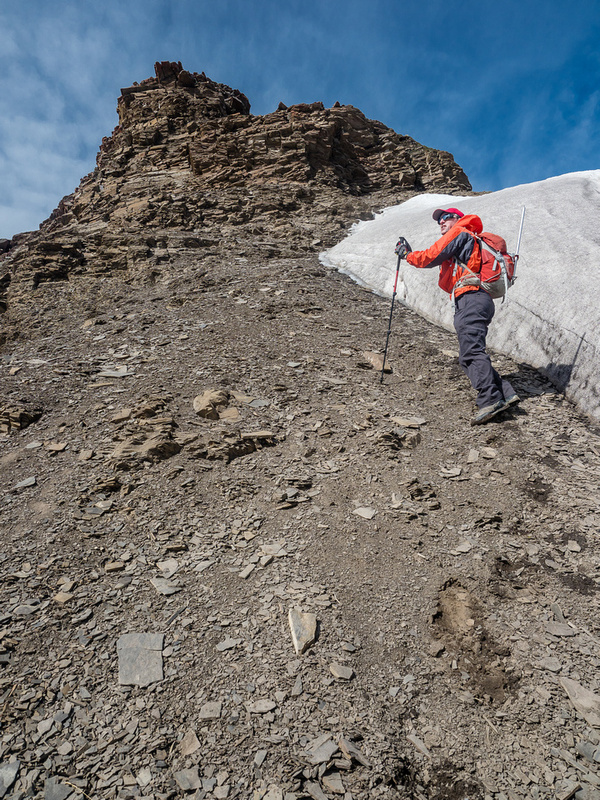 There are no difficulties on Ernest Ross if you stay on trail to the first summit. Some slight exposure is mostly avoidable. Mike on the ridge with the summit rising above. Part way up the ridge we heard a bleating sheep and soon there was a cute kid running right towards us, bleating pathetically! The poor little animal was frightened and alone. It wanted to snuggle but Mike was nervous it might have rabies or something so he didn’t let it. 🙂 We kept hiking while the kid followed behind, letting us know he was there. Eventually he gave up and went looking for his own kind again. 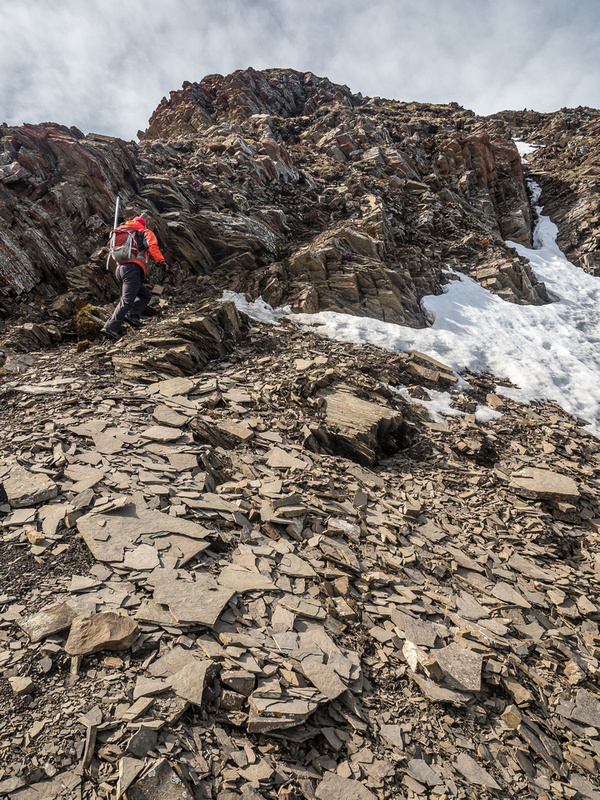 The terrain gets interesting near the twin summits. A wee bit of easy scrambling to the false summit. 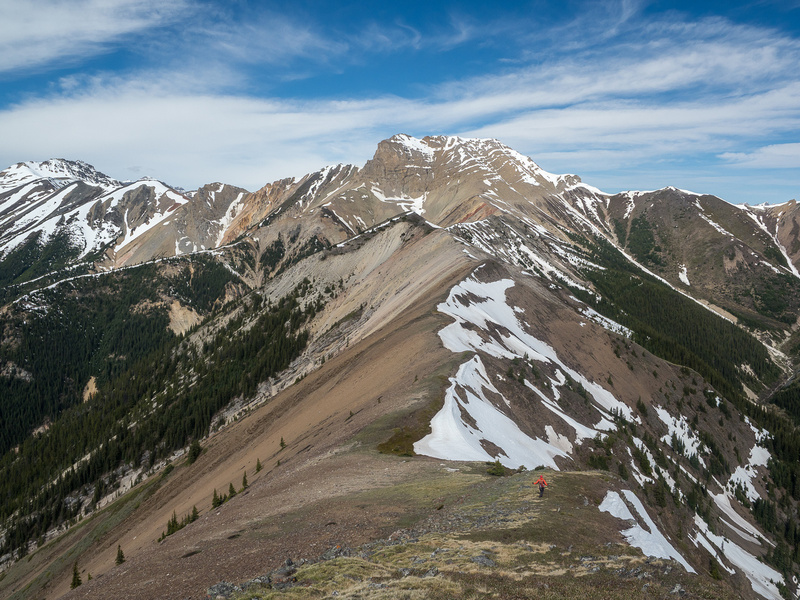 The final scramble to the false summit had a few hands-on moves and the views towards Elliot Peak and over Abraham Lake were stunning, as expected. 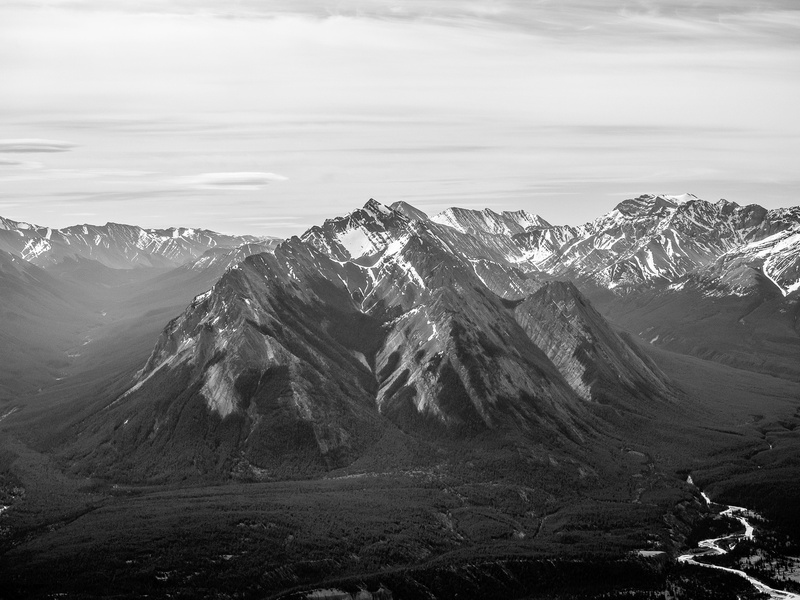 The Ex Coelis group of peaks across the North Saskatchewan River to the southeast were pretty neat too. Further to the south, Mount Siffleur was very impressive along with Murchison. 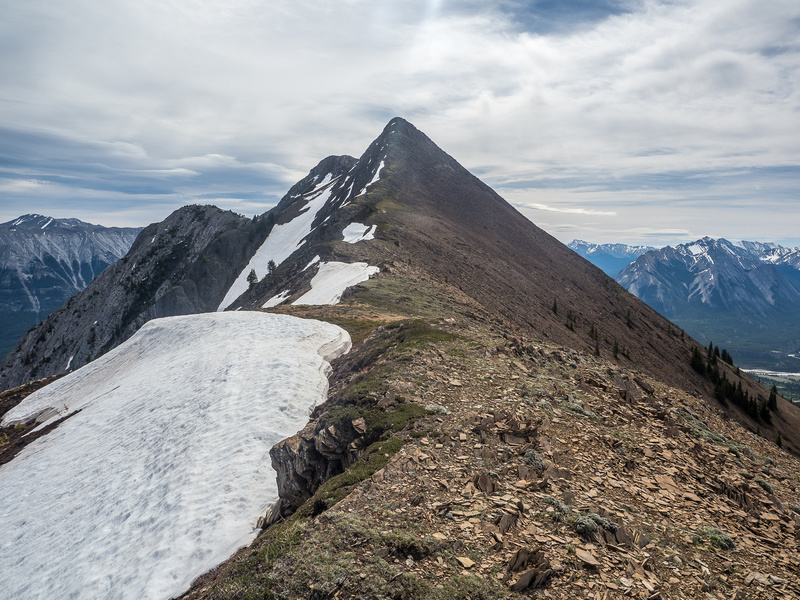 To be honest, Two O’Clock Ridge didn’t look that far and our spirits were pretty high as we turned and descended to the col between the twin summits of Ernest Ross. Mike traverses from the col between the two summits towards the summit of Ernest Ross. 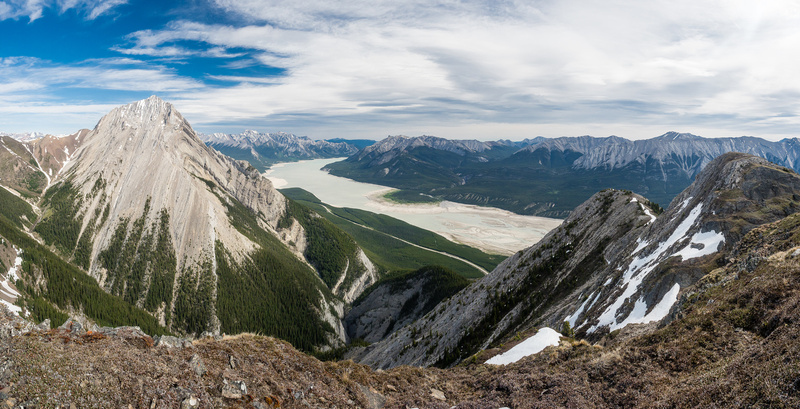 Elliot Peak and Abraham Lake. Looking towards Siffleur, Loudon and Peskett with Two O’Clock Ridge / Peak and Whirlpool Ridge at right. The highest (and official) summit was moderate scrambling via the north side of the summit block and we enjoyed similar views to the first peak from there. After a few minutes spent enjoying the beautiful day, we started down the west ridge of Ernest Ross, heading down towards Bridge Peak to the west. No mystery to this approach! Just head up the ridge. Gaining height above the valley quickly. 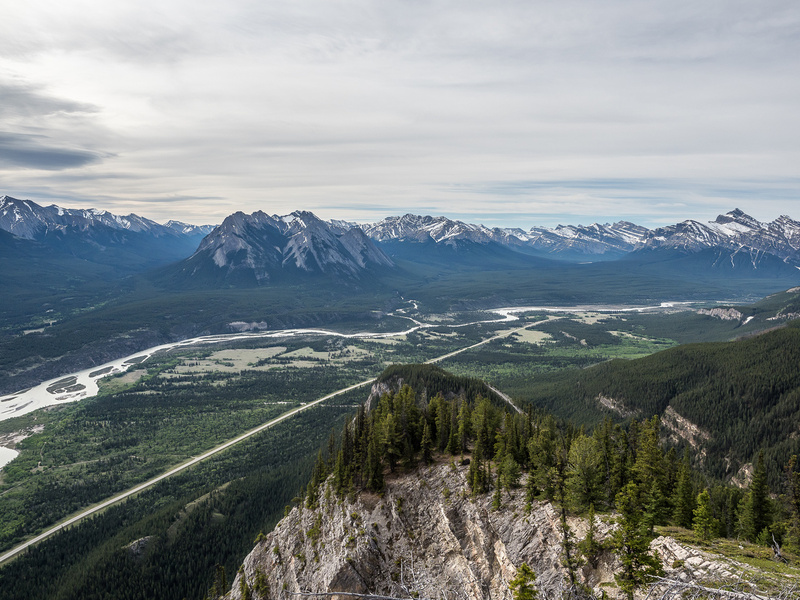 Mount William Booth across the North Saskatchewan River valley. 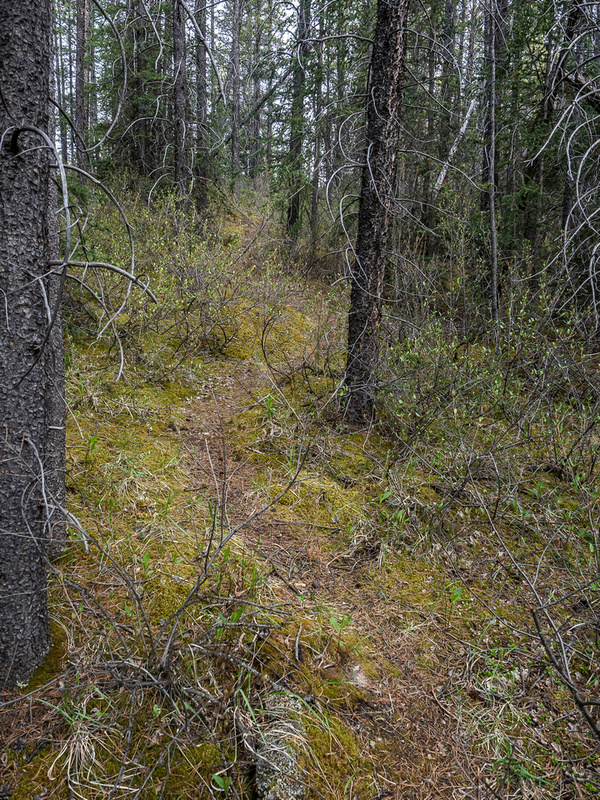 A good trail through the short forested bits. A large part of our day is visible. Ernest Ross at right with Bridge and the ridge to Landslide at center. Two O'Clock Ridge left of center and Whirlpool at left. On the ridge to the summit block. An interesting section of the trail abuts the east face of the mountain - note hwy 11 far below here. Looking back down the ridge towards the Ex Coelis group and up the Siffleur River Valley. The large peak at right is Siffleur Mountain. 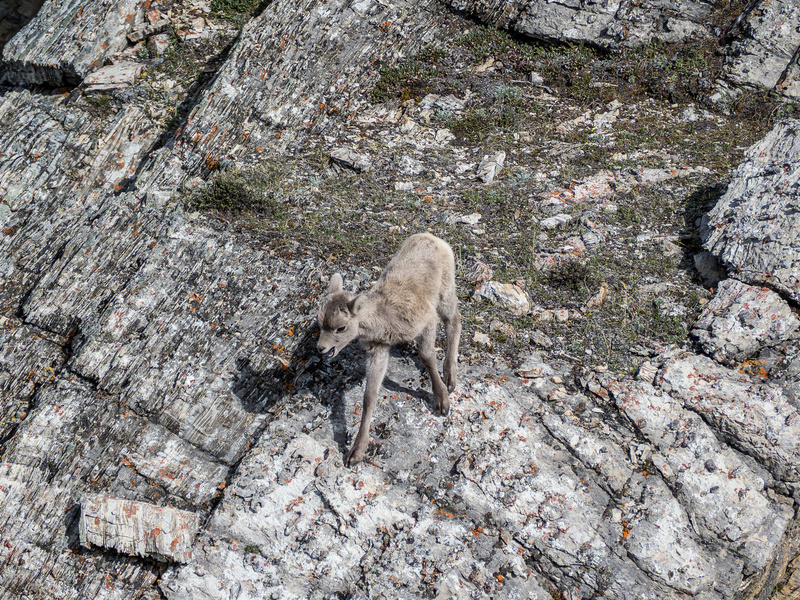 The hiking is generally pretty easy on Ernest Ross. Lots of interesting terrain and landscape features in this area. Our first clear view of the twin summits of Ernest Ross (R) with our loop laid out from R to L in the far distance. This poor little guy wasn't too happy. He just wanted to snuggle I think. 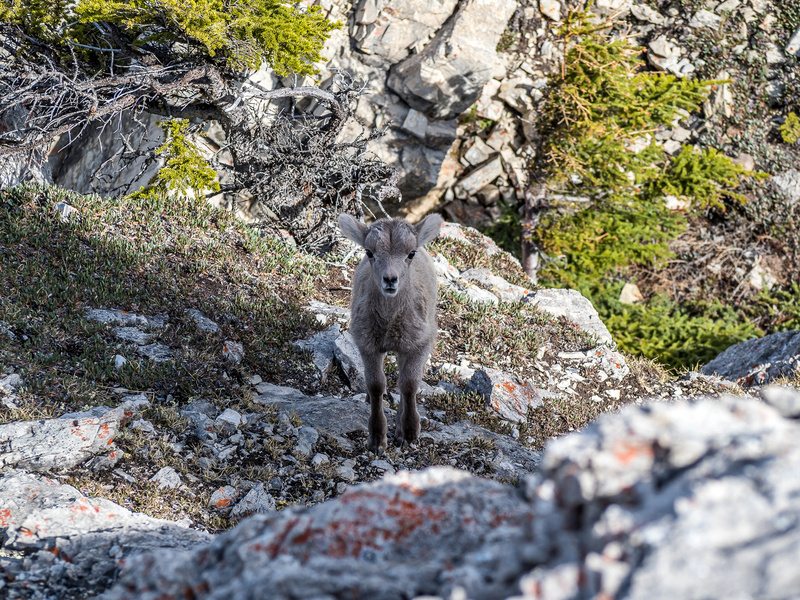 He was certainly scared enough to come to us for help but since neither of us speak "sheep" we couldn't really help him. Mike scrambles to the first summit with the true summit at left. The true summit is much less green than the false one. (L to R), Bridge, Elliot, Abraham, Michener, William Booth and others. 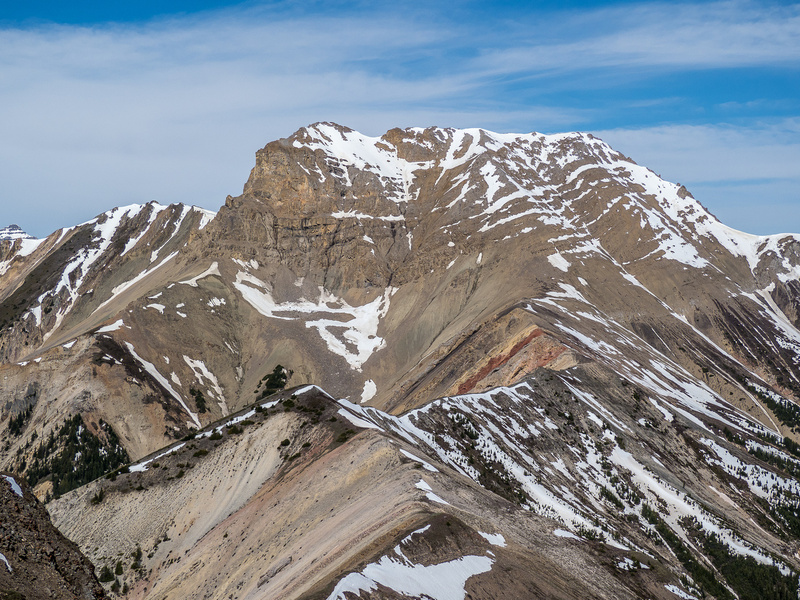 From L to R, Siffleur, Peskett, Whirlpool Ridge, Two O'Clock Ridge / Peak, Landslide Peak, Ernest Ross and Bridge Peak. Elliot Peak to the north is impressively high. 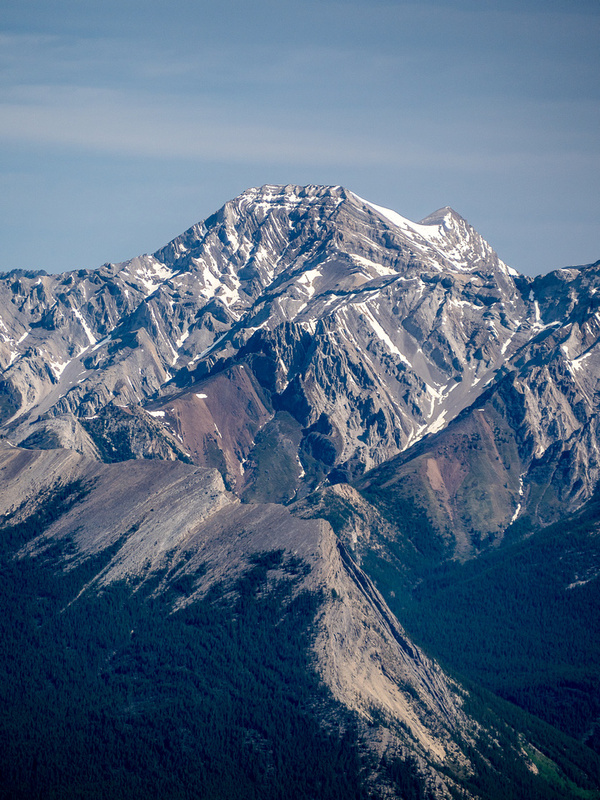 Siffleur, Loudon and Peskett are also impressively high mountains at near or over 10,000 feet high. From L to R, Stan Waters, Normandy, Rhine, Elbe and Ardennes Peak. 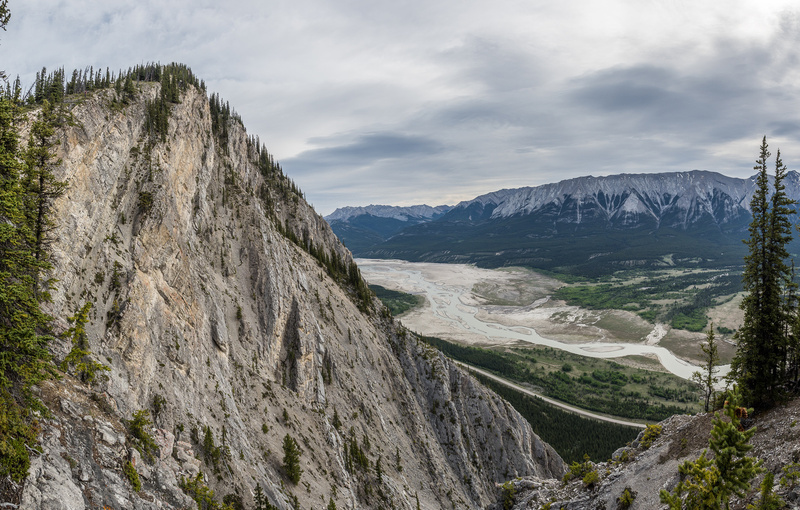 Looking east over Abraham Lake. 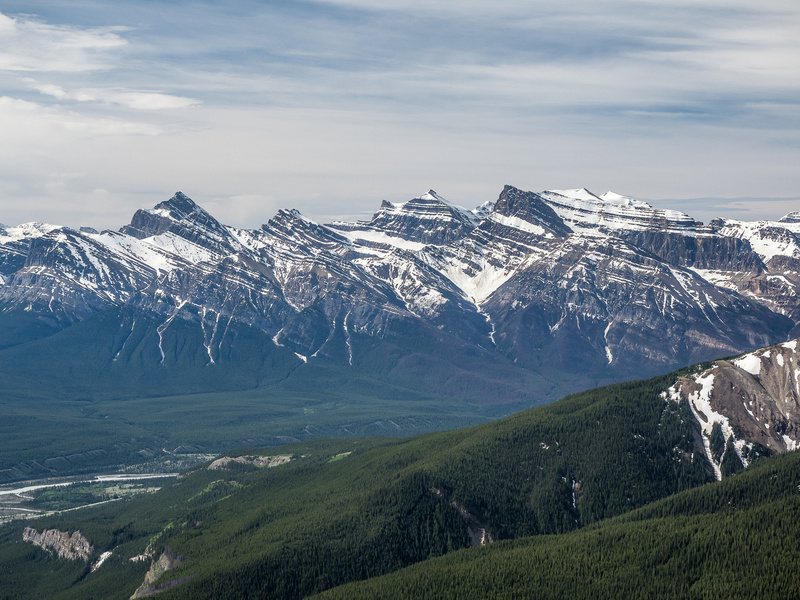 At left is Allstones and Abraham Peaks and at right is Mount Michener. Bridge Peak is certainly higher and more impressive than Ernest Ross. A very distant Landslide Peak is making me question wearing light approach shoes - there's a lot of snow back there! Allstones is a distinctive peak to the east. 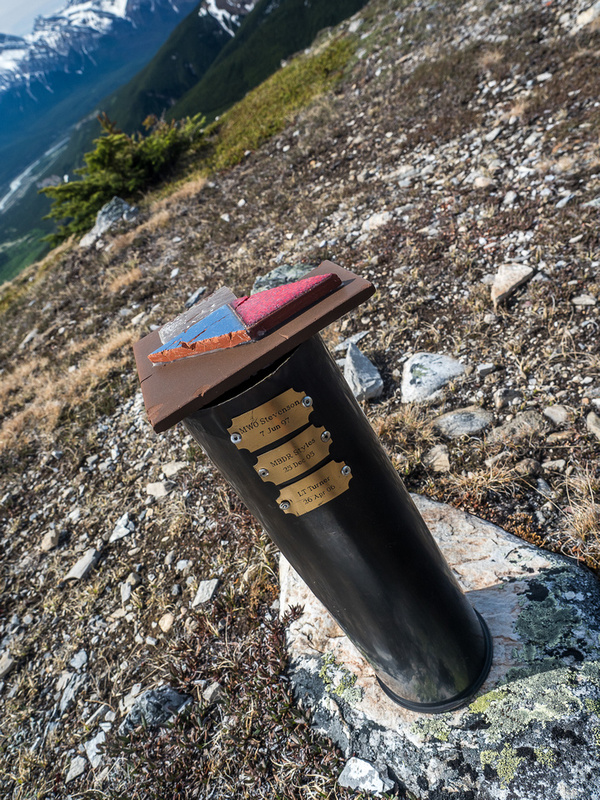 A memorial of some sort at the false summit of Ernest Ross. 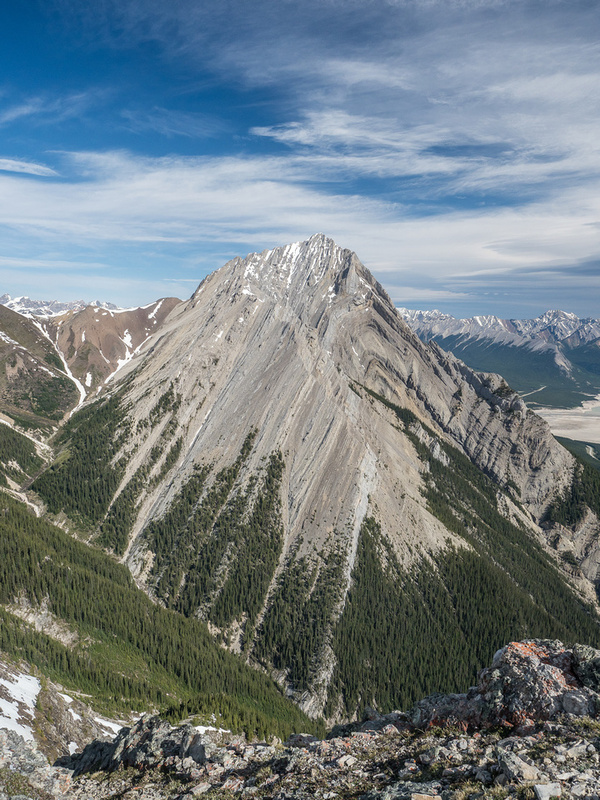 Elliot Peak with Abraham Lake. 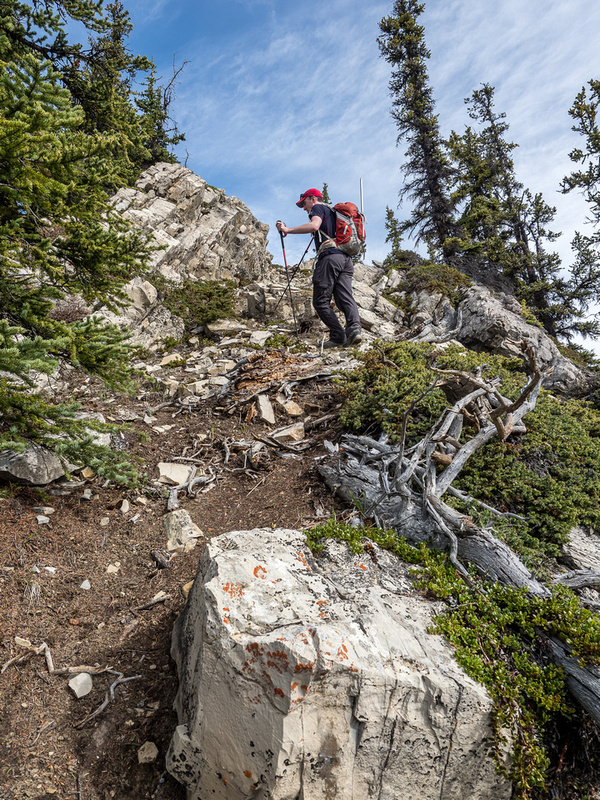 On the north side, going for the summit on moderate terrain. Our route visible in front of us from right of center over Bridge Peak and then left around the distant peaks before exiting Two O'Clock Ridge. 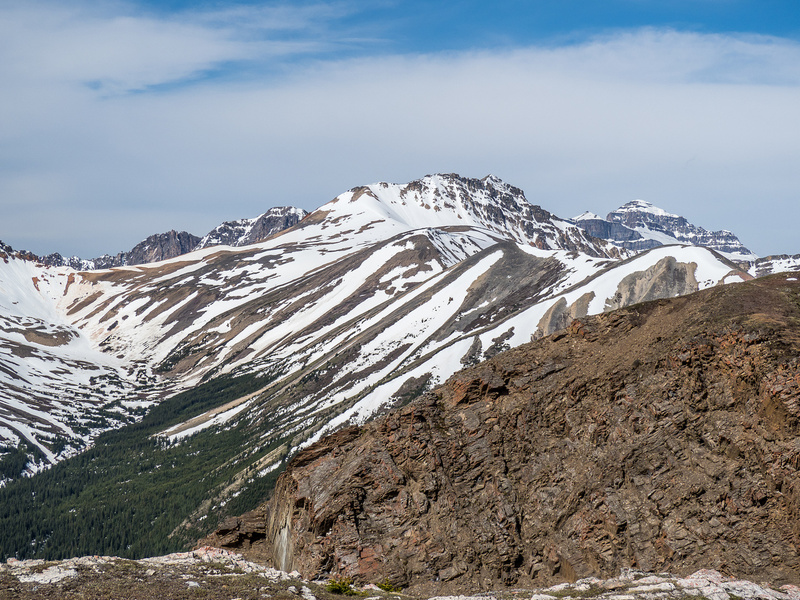 Looking north and east at Elliot Peak (L) and the false summit (R). Mike heads down the west ridge of Ernest Ross towards Bridge Peak. 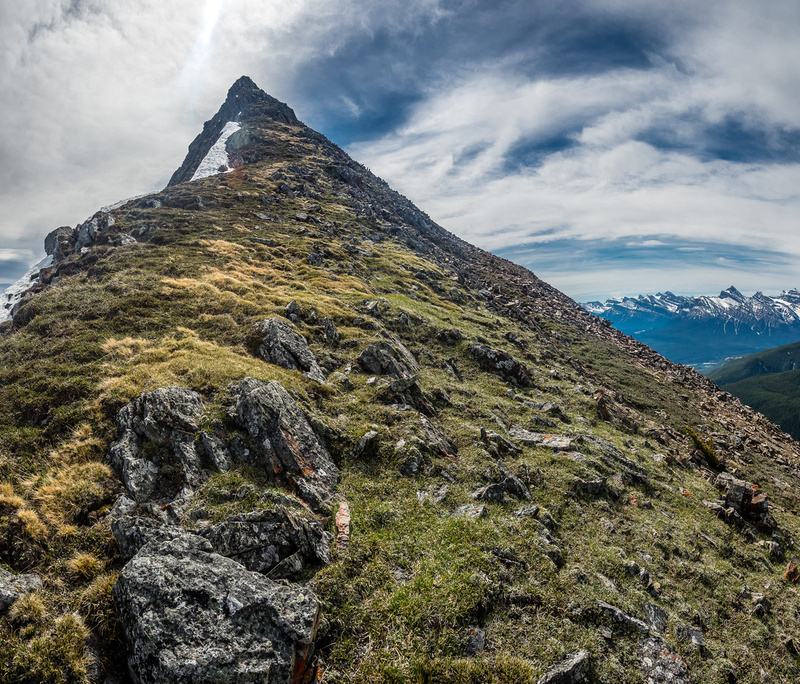 A surreal view back to the summit of Ernest Ross from the west - I think this looks like a peak in Iceland.